poultry. Excellent with spicy food, especially asian and indian cuisine. - Characters grape, prune, peach. Vines grown on the principle of sustainable viticulture, using organic fertilizers, natural weed and other techniques to preserve the best of nature. The old vines are no longer torn but maintained by inter-planting to preserve the diversity of genetic potential. Winemaking : Picked by hand, with selective screening on the bunch. 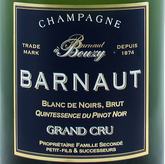 100% Pinot Noir for the typical expression of the grape variety on this specific terroir. lasting properties. Stock nearly 3 years. Dosage: 6 grams per litre. Aspect: deep golden colour, fine creamy mousse. - Bouquet: spices, wheat, flowers, plums and white fruits. - Palate: fresh attack, well-rounded, long, structured, potent, - fruity and well-balanced.